Known for their wide variety of vibrant plumage, birds have evolved various chemical and physical mechanisms to produce these beautiful colors over millions of years. A team of paleontologists and ornithologists led by Yale University has now discovered evidence of vivid iridescent colors in feather fossils more than 40 million years old. The finding, published online August 26 in Biology Letters, signifies the first evidence of a preserved color-producing nanostructure in a fossilized feather. Iridescence is the quality of changing color depending on the angle of observation, such as the rainbow of colors seen in an oil slick. The simplest iridescent feather colors are produced by light scattering off the feather's surface and a smooth surface of melanin pigment granules within the feather protein. Examining feather fossils from the Messel Shale in Germany with an electron microscope, scientists have documented this smooth layer of melanin structures, called melanosomes. "These feathers produced a black background with a metallic greenish, bluish or coppery color at certain angles—much like the colors we see in starlings and grackles today," said Richard Prum, chair of the Department of Ecology & Evolutionary Biology at Yale and one of the paper's authors. For more than 25 years, paleontologists have found microscopic tubular structures on fossilized feathers and hair. 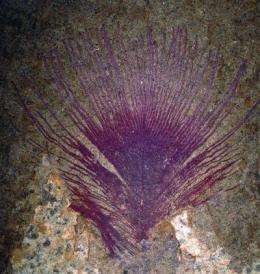 These were long interpreted as bacteria that had digested the feathers at the time they were fossilized. The team had previously discovered that these structures were in fact not bacteria but melanosomes, which then allowed them to document the original color patterns. Following up on the new finding, they are racing to discover what additional coloration features may be found in fossil feathers. "The discovery of ultra-structural detail in feather fossils opens up remarkable possibilities for the investigation of other features in soft-bodied fossils, like fur and even internal organs," said Derek Briggs, Yale's Frederick William Beinecke Professor of Geology and Geophysics, and an author of the study. The discovery could pave the way for determining color features of other ancient birds and even dinosaurs, the team said. "Of course, the 'Holy Grail' in this program is reconstructing the colors of the feathered dinosaurs," said Yale graduate student and lead author Jakob Vinther. "We are working hard to determine if this will be possible."